There's nothing new about Governor Jerry Brown's disclosure last weekend that the state budget deficit has swelled to $16 billion. Anyone who is surprised by the revelation must have spent the past 11 months scuba diving at the bottom of Lake Tahoe. If anything, the announcement is a painful reminder of just how far Californians will go to avoid taking political responsibility. That includes everyone--the governor, the legislature, and the voters. Let's remember that the fiscal year began with a "balanced" budget missing $8 billion. How could that be? Because the the legislature passed and the governor signed a budget with assumptions that few people trusted as anything other than creative math. the Department of Health and Human Services would allow California to reduce its Medi-Cal payments. Add to those three assumptions a series of law suits that prevented the state from imposing other cuts and you have a recipe for disaster, which is exactly what we now have. Legislative Democrats knew the budget was little more than wishful thinking. Legislative Republicans gave Democrats no choice by stubbornly refusing to accept any new meaningful revenues. The governor signed the "balanced" budget hoping that things would improve, with his November temporary tax increase the last part of the solution. Things have only gone down hill from there. Month by month, Controller John Chiang has announced lower revenues and higher expenditures because of the conditions outlined above. Last January, when Governor Jerry Brown could have reduced funding for already starved institutions and programs, he made modest cuts of less than one billion dollars. 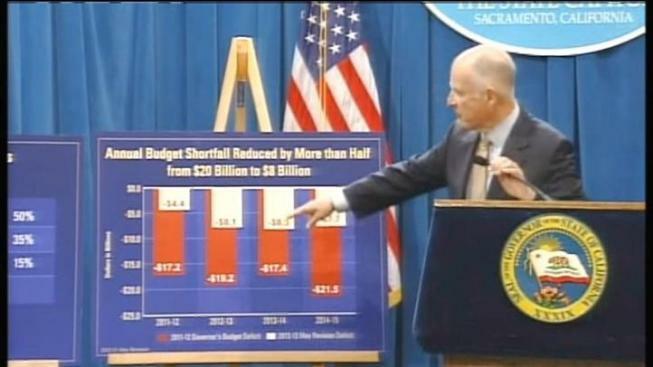 By then we were already more than $10 billion in the hole, but Brown chose to avoid using the cleaver. The people haven't helped. Public opinion surveys repeatedly have revealed an ignorant polity unaware of how much money is collected and where it is spent, unwilling to reduce spending for most programs, and only mildly interested in considering Brown's temporary tax hikes which now clearly are not enough to make the state whole. Clearly, reality is in short supply in California. Now California approaches the end of a fiscal year deeply in debt, and with the prospects of more debt in the months to come. Will people ever realize that we must raise taxes from a variety of sources to survive? As the legislature and governor respond to this crisis over the next few weeks, we'll learn much about their character. Perhaps we'll learn something about ourselves as well.